Good food and good science always go well together and I like to combine the two every chance I get. Fortunately, my tastes allow me to use very broad strokes when classifying “good food.” One time it might be a cool new tapas bar with select Spanish wines, and the next it could be an elegant steak and seafood bistro with a full bar for a nice cockle-warming Glenfiddich 18 single malt Scotch. If I’m allowed to smoke a fine Cuban cigar at the same time, I’m in nirvana. What I choose all depends on where I am around town for a stimulating astrophysics lecture or seminar. I try to plan out the food part of the equation well in advance. When I’m in Pasadena, in and around the Caltech campus, there are plenty of culinary options across the entire spectrum. Pasadena is a chowhound’s paradise. But sometimes I like to keep it simple and continue my never-ending search for the perfect burger. In that case the decision is pretty easy because Pie 'N Burger, the Caltech mainstay greasy spoon, is just a few minute walk west from campus over on California Blvd. I love the place and I have so many great memories invested there. Every time I walk in, I envision the late great Richard Feynman sitting at one of the ancient wood chairs at the counter, scribbling some QED equations. I’ve heard that general relativity maven Kip Thorne is known to go there. And one time after a rousing LIGO seminar over in East Bridge (the lecture was called “Gravitational Waves and Multimessenger Astrophysics”), I ran into the speaker for the lecture, Szabolcs Marka from Columbia University, who was sitting at the counter with a colleague and his small son. We had a very nice chat as the burgers sizzled on the grill. 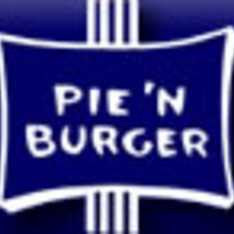 I’m afraid that I’ve never had a pie at the venerable Pie 'N Burger, but I’ve had many a good cheeseburger. I don’t know what they do to them, but they’re one of the best burgers in town. The place is short on aesthetics but high on nostalgia with that long time Caltech association. First opened in 1963, Pie 'N Burger has become an institution of science food in my mind. Highly recommended! I was at pie & burger one weekend and the earthquake woman you always see on the news was there.